When we started thinking about re-enacting Malcolm Le Grice’s Horror Film 1 a year ago, several questions popped up straight away. These were mainly technical issues about the source material for the three colour projections, and how the audio is produced while the piece is being performed. Some of these questions were answered by Malcolm here – but it’s only now that we’ve spent several days hanging out with him that we begin to understand these answers. Our instinct was that the amplified breathing which provides the sonic undertone of the work would be produced live – a live feed from a lapel microphone, for example. This would seem to fit with the live-ness of the projected shadows produced by the body in front of the three projectors, and could operate as a kind of index of the performer’s own physiological state (calmness, exhaustion etc) during the performance. Louise and Lucas are busy this month. Lucas is presenting (via Skype from London), speaking briefly about our work re-enacting Expanded Cinema from the point of view of medium and materiality. You can read the abstracts and the panel synopsis here. 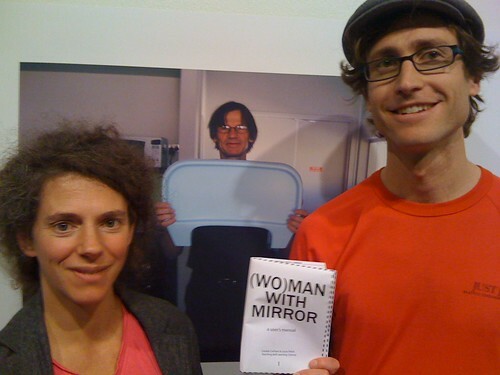 Lucas and Louise will be performing (Wo)man with Mirror and engaging in discussion afterwards, at a conference in London. The conference is called “Museum Futures in an Age of Austerity” and the details are here. Here’s the draft conference schedule. Apiary Studios, 458 Hackney Rd. Louise and Lucas are performing (Wo)man with Mirror and engaging in discussion afterwards, together with Dr Patti Gaal-Holmes & Dr Kim Knowles. Guy Sherwin “himself” will be there, along with his partner and collaborator Lynn Loo. This event was kindly organised by Sally Golding and is an Unconscious Archives Salon. This project has been assisted by the Australian Government through the Australia Council, its arts funding and advisory body, with support from ACME studios in London. Here is a flyer from ACME studios as a PDF. Louise Curham will be showing her handmade super8 films in collaboration with musician Alison Blunt. The evening also features the work of Karel Doing and Pierre Bastien. This event is number 8 in the Unconscious Archives series organised by Sally Golding and James Holcolmbe. All the details are here. What are we doing in England? Here we are with Malcolm Le Grice in his studio in Devon. Louise Curham and I have come to Devon, complete with a big and patient entourage (our families!). Malcolm still performs this key work of expanded cinema – in fact there’s been a resurgence of interest and lots of requests for him to do it, ever since the turn of the century. This project has flowed from the work we did re-enacting Guy Sherwin’s “Man with Mirror”. Our re-enactment of Guys’ piece was first performed in 2009, and we’ll present it in London for the first time very soon – details here. The Horror Film project, of course, has a range of different challenges and we can’t pre-empt how we’ll resolve them before we jump in and start playing with the work using our own bodies. However, even before we start, we’ve been really enjoying talking through a whole range of practical and philosophical issues with Malcolm in his studio in Devon – and we also spent some fun days with Steven Ball and David Curtis, in the archives at the British Artists Film and Video Study Collection at Central St Martins College in London. This project has been assisted by the Australian Government through the Australia Council, its arts funding and advisory body, with support from ACME studios in London. Part of Critical Path’s Artists’ Salon series, Moving Image 1 looks at experiments with movement within interdisciplinary practice and is curated by Narelle Benjamin and Sue Healey. It will feature a discussion with and studio presentations of work by artists Sam James (From the Rainforest Mind to the Desert Mind) and Louise Curham and Lucas Ihlein ((Wo)man with Mirror). Saturday 11 May, studio open from 3pm onwards with 4pm event start. Free event, but please RSVP here. The Drill Hall will be open from 3.00 pm for viewing of Sam James’ installation. Published on January 15, 2013 in expanded cinema, Screenings, screenings other than TLC and Sydney Moving Image Coalition. 2 Comments Tags: Kosugi, Lanfranchi's, SMIC. 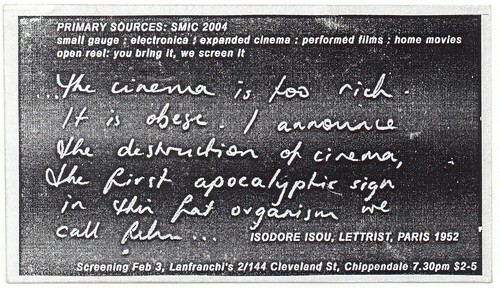 SMIC Primary Sources poster for 3 Feb 2004 screening, Lanfranchi’s, a photo by lcurham on Flickr. About Primary Sources and the 2004 screenings (page 1, page 2) – a manifesto! The screenings continued for some time. We’ll put up more archives soon. It’s important to point out that Tony Woods, Al Young, Dan Edwards and (Lanfranchi’s) Brendan were critical in establishing SMIC. Published on June 10, 2012 in Anthony McCall and expanded cinema. 0 Comments Tags: Anthony McCall, Book, Essays, Long Film for Ambient Light, Perform Repeat Record. 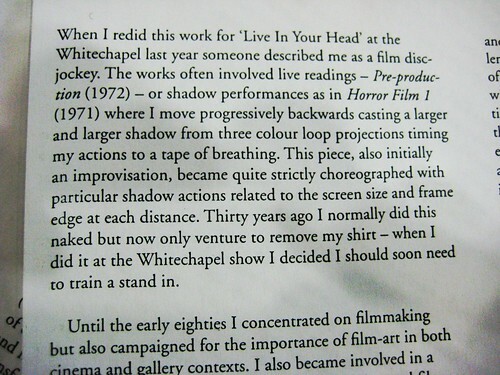 A chapter I wrote about our 2007 re-enactment of Anthony McCall’s Long Film for Ambient Light has been included in the book Perform Repeat Record: Live Art in History, edited by Amelia Jones and Adrian Heathfield. Louise Curham and I were really pleased to be involved in this publishing project, which places the work that we are doing with “researching Expanded Cinema via live action” alongside many other attempts by artists and curators to revisit performative works of the recent past. A review, written by Caroline Wake, was published in Realtime. You can read the chapter as a pdf file here. 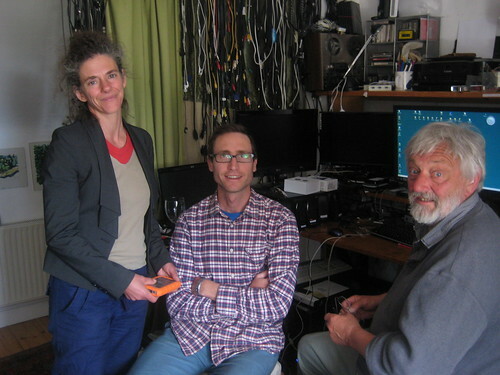 In 2009, Lucas Ihlein and Louise Curham presented a paper at the Re-Live Media Art Histories conference in Melbourne. There seem to be some problems accessing the proceedings online, so we’re posting the paper here on our own website in the spirit of collegiality. It’s entitled Re-Enacting Expanded Cinema: Three Case Studies. 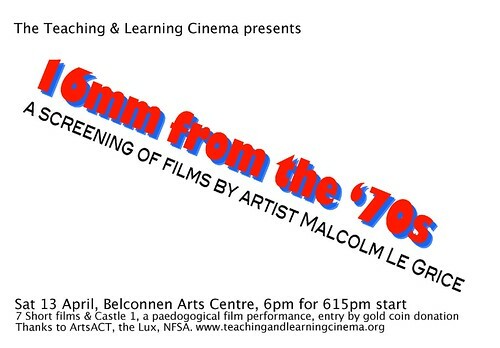 Since 2003, the practice of Sydney’s Teaching and Learning Cinema has involved the re-enactment of Expanded Cinema performances from the 1960s and 70s. As artists, we have discovered that direct access to the work of our aesthetic precursors is essential for understanding, and building upon the work of the past. 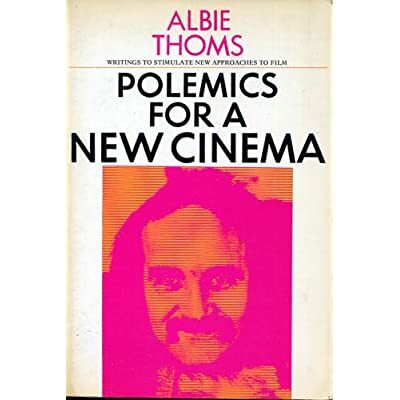 However, since many Expanded Cinema events were ephemeral and situated in time and place, they do not easily lend themselves to documentation and archiving. As a result, the works are poorly represented in art history. Re-creating them in our own ‘here and now’ is a creative pedagogical process, in which the works become available once again for first-hand experience. Clearly, these re-creations are not ‘authentic’ or ‘correct’ – rather, the very concept of authenticity and the integrity of the bounded art event are brought into question by this unique form of practice-based research. In this paper, we touch on three three Expanded Cinema works we have re-created – William Raban’s 2’45” (1973); Anthony McCall’s Long Film for Ambient Light (1975) and Guy Sherwin’s Man with Mirror (1976). We discuss the dilemmas that emerge from such a process. Geographical distance, cultural context and technological developments all make significant demands on the resourcefulness and wit of the re-enactors. Emerging from this process, our re-enactments generate an organic living history, in which the works are ‘kept alive’ through the practice of passing them from one generation to the next. You can download the pdf of the paper here. PS: Some of my earlier thoughts on re-enactment as a strategy are here.